The Walk was soooo much fun. 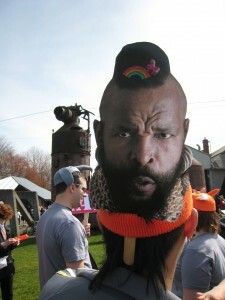 Our tent was just as I’d predicted/warned: a mix of 5th grade girl’s b-day party and the A-Team. Lots of streamers, balloons, sparkly stickers and prissy whatnot. We even won the Most Team Spirit award. Not sure how, exactly, but we did and we totally deserved it. Plus, it was a really beautiful day–the first Seattle has seen in ages. And, we raised more than $6,000. Go us! I love my silly friends. Next post: is it the weather?